Spectacular Sea Bridge home on Coral Island. This home with over $175,000 in tasteful upgrades is the find all buyers have been waiting for. Attention to detail is an understatement for this Luxurious Seaside home. On arrival notice the lush landscaped property being greeted at the front entrance with water fountain leading through the stunning leaded glass entry door into dramatic, detailed floor to ceiling wood paneled walls & post into the formal living room. Finished with gorgeous crown molding everywhere and throughout,complemented with handsome travertine flooring. Top of the line kitchen, appliances, custom hardwood cabinets with custom pull knobs, full size built-in double door frig. Three full size fire places, all ornately faced, mantled that blend marvelously. Plantation shutters and custom window coverings, recessed lighting and enchanting Chandeliers. French Doors open to outside entertainment area. Walk to shops, seaway and clubhouse. Come and Live in Paradise. Below Link is more information and photos. It is a report that provides you with the information you need to set a value on the home you own. A Comparative Market Analysis (CMA) compares the prices of recently sold homes that are similar to yours in terms of location, style and amenities. CMA's often include information on properties currently for sale plus the properties which failed to sell. This information gives homeowners a fair estimate on the value of a home. Thinking about selling your home in the next 12 months? Use our FREE service to help you find out what your home is worth. To Start Shopping For Your Next Home Simply Register Below. For detailed information on buying a home or property, please complete the form below describing the type of home you are looking for. We will get back to you as quickly as possible with your results! Please choose an option. $50,000 to $100,000 $100,000 to $150,000 $150,000 to $250,000 $250,000 to $350,000 $350,000 to $500,000 $500,000 to $1,000,000 Over $1,000,000 Price range? Please choose an option. Single family Town house Condominium Other Type of home? Please choose an option. 1,000 to 2,000 sq. ft. 2,000 to 3,000 sq. ft. 3,000 to 3,500 sq. ft. over 3,500 sq. ft. Size of home? Please choose an option. Two bedrooms Three bedrooms Four bedrooms Five bedrooms Bedrooms? Please choose an option. Two bathrooms Three bathrooms Four bathrooms Bathrooms? Please choose an option. Elementary Middle school High school Desired school nearby? Please choose an option. Under 5 years Under 10 years Older than 10 years Age of house? Please choose an option. Immediately Within 2 months Within 6 months Within 1 year Undecided When to purchase? Please choose an option. Yes No Need to sell your present home? Please choose an option. Yes No Prequalified by a lender? Please choose an option. Yes No More information on financing? Please choose an option. Please call daytime Please call eveningtime What is the best time to contact you? 4. Please mail us a personalized MLS list of homes in my range. Note: Be sure to fill out below the mailing address information to receive the MLS list! This beautiful picture perfect beach home is beyond move in ready. If you are looking for the perfect beach home whether for your vacation home or your full time residence look no further. This 3 bedroom 2 bath home with private courtyards, patios, and side yards reeks of relaxation. You will think you have stepped into a model home. Tile floors throughout with carpet in key locations. Tastefully flavored colors inside and out with plenty of natural light to add and change texture throughout the day. Custom cabinets, shutters on most windows, formal and casual dining rooms, breakfast bar, family room with fireplace and bar, large two car attached garage. You will love this place! Featuring a 2 Bed + 1 Bath home in the Pinewood Condominium Community in Oxnard's south side. The easiest COASTAL COMMUTE to Santa Barbara; 45 minutes! Located near many Shops, Markets & schools, right around the corner. Many people are relocating to the glorious Oxnard Plains and experiencing it's brimming lifestyle, and for many great reasons. Enjoy the area's mild year-round Mediterranean-style weather. Take daily excursions to the area's MANY fabulous beaches for swimming, surfing, fun & DAZZLING SUNSETS. Fancy boating and sporting in the Channel Islands & Ventura harbors. And talk about LOCATION!!!! Your new home resides between Santa Barbara to the north, a 45 minute coastal commute, and Point Mugu & Malibu to the south, a short coastal jaunt on the scintillating Pacific Coast Highway. Did we mention LA is only an hour away? Listings Data Provided by Ventura County Regional Data Share. Information is provided for consumers' personal, non-commercial use and may not be used for any purpose other than to identify prospective properties consumer may be interested in purchasing. 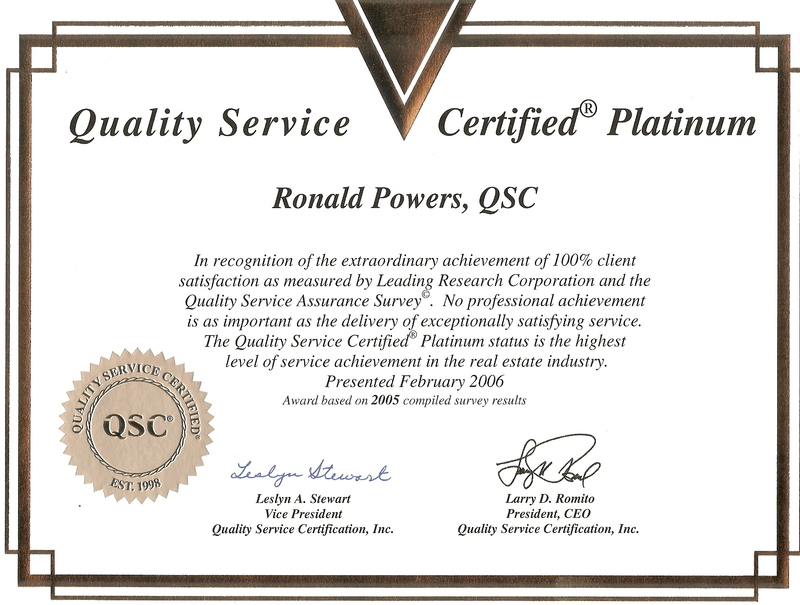 RON POWERS of Prudential California Realty in Oxnard, CA was just granted Quality Service Certified® Gold status in recognition of the exceptional service satisfaction as measured by Leading Research Corporation and the Quality Service Assurance Survey©. The following is an article written by Prudential California Realty Broker/owner Bob Majorino. A version of it appeared in the Ventura County Star. The reality is there is absolutely nothing wrong with OR surprising about today’s real estate market. Houses are still selling and buyers are still buying. Some houses are sitting on the market for months, while others are selling without a problem. Why is that? Well, any market which experiences an increase in inventory of 250-300% in a very short period of time will create more competitiveness among sellers. This does not mean that the value of your real estate investment has diminished. It means that, in a more competitive environment, someone may be more motivated by personal needs to sell sooner than you might be. Timing is the real factor involved, not the integrity of the investment. Because you see, the beauty of real estate ownership in California – and especially in Ventura County – is that if you want more money, just wait for the market to change to suit your personal needs. If you need money now, you can refinance at some of the lowest interest rates in history – tax free – until the market favors selling at the price and terms you find more attractive. If you need to move now, you may find that you can rent your property temporarily for the same reason. Talk to a Realtor for information on these alternatives. Famed oil magnate J. Paul Getty was once asked by a newspaper reporter, “Mr. Getty, what is the secret to your success?” With a sly, craggy-faced smile, old J. Paul said, “Son, it’s simple. When everyone else sells, I buy!” Based on that theory, if you bought real estate between 1980-1985 or 1990-1995 – doom and gloom years representing the most recent market slowdowns – you are sitting pretty today if you still own it. Buying was the smart move. The sellers in those years were all trying to beat the market, i.e., buy at the lowest and sell at the highest. If this is your goal, go to Las Vegas and have some fun while you lose. If you want to make money, don’t do that. bonds MUST be the thing to buy to get rich quick. If you bought one house in the year 1999 when the stock market was going crazy with billions invested in useless “dot-com” hot-air investments, you could have made 50-100% return on your investment every year from that year until the present time! Understand that when everyone tries to beat each other to the finish line, they create the adverse conditions, which prevent them from winning their own game. The one issue of real estate invest-ment that most people do not do well with is the holding period. Real estate ownership is primarily intended to build wealth – not to make $30-$40,000 with a quick “flip” from one buyer to the next. Although that amount of money may solve a few small problems around the house, it is not how real wealth is accumulated. After selling costs and taxes, there isn’t that much left. Long-term ownership is the answer. Own the house until you find something more favorable, based on your needs, and then replace it with the next. Don’t ever get out of the ownership position. With this strategy in place, one day you will wake up wealthy, because you have accumulated a substantial amount of equity, possibly untouched by taxation if you are an investor. Isn’t it interesting how most of what the average person does with his or financial wherewithal is done based on what everyone else is doing? If everyone else is buying stocks and bonds, then stocks and bonds MUST be the thing to buy to get rich quick. If you bought one house in the year 1999 when the stock market was going crazy with billions invested in useless “dot-com” hot-air investments, you could have made 50-100% return on your investment every year from that year until the present time! Understand that when everyone tries to beat each other to the finish line, they create the adverse conditions, which prevent them from winning their own game. If you are talking about owning real estate as a home, then buy what you want to live in and can afford comfortably and live in it – enjoy it! If you want an investment, buy real estate and hold it long term. You will win. The real estate game is fun and profitable, if you calm down and do what’s right for you and your family – not what everyone else is doing. Just think about it – how much did your mom and dad pay for their house? Many economic gurus are saying the “R” word …. recession. For the most part, the U.S. economy has been strong and business has been good for the past decade. However, the economy goes through cycles. Even if we don’t see a full-blown recession, business is slowing for many people. Unfortunately, every time the economy takes a downturn, the fallout is felt strongly by salespeople, business owners and professionals alike. Successful business professionals learn from the past. For some, this will not be our first recession. So what did we learn from previous economic downturns? In the early ’90s, right in the middle of a nasty recession, I was at a business mixer in Connecticut meeting many local business professionals. It seemed that everyone was feeling the crunch from the slow economy. Throughout the entire event, the favorite topic of discussion was how bad the economy was and how things were getting worse. The whole affair was depressing because nearly everyone was obsessed with the problems of the economy and its impact on his or her business . I AbsolutelyRefuse to Participate in a Recession! Considering what he said, I looked around the room and listened in on people for a while as they complained about how bad business was. While nearly all were commiserating with one another, I concluded that very few were actually networking and working on seeking new business. As a result, very little business was actually being accomplished. If you want to do well in business, you must understand that it does absolutely no good to complain to people about tough times. When you complain about how bad business is, half the people you tell don’t care and the other half are glad you’re worse off than they are. This is syndicated from Networking Now, and written by Ivan Misner. LOS ANGELES (Oct. 10) – Home prices throughout most of California will post modest declines next year while sales of existing homes will stabilize from the precipitous decrease experienced in 2007, according to the CALIFORNIA ASSOCIATION OF REALTORS® (C.A.R.) "2008 California Housing Market Forecast" released today. The forecast will be presented this afternoon during the CALIFORNIA REALTOR® EXPO 2007 (www.realtorexpo.org), running from Oct. 9-11 at the Anaheim Convention Center in Anaheim, Calif. The trade show attracts nearly 12,000 attendees and is the largest state real estate trade show in the nation. Leading the way...® in California real estate for more than 100 years, the CALIFORNIA ASSOCIATION OF REALTORS® (www.car.org) is one of the largest state trade organizations in the United States, with nearly 200,000 members dedicated to the advancement of professionalism in real estate. C.A.R. is headquartered in Los Angeles.